A post-apocalyptic road novel based loosely on the myth of Theseus and the Minotaur, Running on Fumes follows an unnamed narrator on a journey to reconnect with his father nearly five thousand miles away. The catalyst for this journey (through both a desolate landscape and a despairing mind) is a seemingly benign power outage at the refinery where the narrator works as a mechanic. Having recently received a frantic call from his confused father, been abandoned by his lover, and now bored since work has stopped, he decides on a whim to drive east and reconnect with the man he hasn’t seen in years. Taking his meager savings and few possessions, along with the cat his lover left behind, the narrator discovers little by little just how serious the power outage really is. With each town and city he passes through (though these are few and far between), he hears a new story about riots in the big cities, social chaos, and martial law. And yet, this book is just as much about the proverbial “trip down memory lane” as it is about a white-knuckled drive through a hostile landscape. Against his will, the narrator thinks through the events and decisions that brought him to his current situation: the death of his mother in a puzzling car crash, his father’s grief-stricken withdrawal, the narrator’s own wanderings from town to town in search of work and distractions. His companions on this trip- the cat, and then a mysterious woman and her ex-lover’s friend- function as strangely-colorless counterpoints to the narrator’s own life, such that the reader wonders if they even exist at all. Often, the narrator passes between wakefulness and exhausted delirium, at times dreaming about his upcoming reunion with his father. Simultaneously gritty and poetic, Running on Fumes appeals to our deep-seated fascination with apocalypse, disaster, and the collapse of civilization. While reading this novel, I was reminded of the unfortunately-canceled Canadian-American tv show “Revolution” (2012-14), which, like this story, patiently charts the social erosion that occurs after a disastrous event (in both cases, it’s a massive power outage). In Running on Fumes, we never learn the actual cause of the outage, but that isn’t the point. 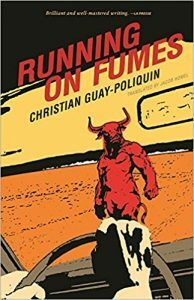 Guay-Poliquin’s emphasis, rather, is on the journey the narrator takes in his own mind (through grief, bewilderment, regret, and hope) across the barren landscape of his memories. So while a retelling of the Theseus-Minotaur myth as a son hunting down the stranger that is his father through a labyrinth made of civil unrest and wasteland is intriguing and even mesmerizing at times, ultimately the story lacked a kind of animating spirit. The narrator is so emotionally lost that his unrelenting despair, at times, drags the reader down. The narrator’s travel companions are flat characters (though, like I said, that may be purposeful because they might not actually exist) and his run-ins with various bands of people along the way are brief and somewhat bland. A road trip as an opportunity to examine one’s own life isn’t new; neither is the retelling of the Minotaur myth. By mixing these two and adding a helping of mysterious disaster, Guay-Poliquin offers us a fresh and interesting take on all three themes. Could the book have been more intense, detailed, and fleshed out? Most definitely. Is it nonetheless a fascinating work of speculative fiction? Indeed it is.